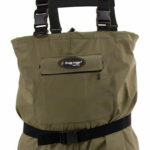 The Frogg Toggs Hellbender Chest Waders are mid range breathable waders and cost around $125. A first glance at the included features looks promising and could make up a great pair of fly fishing waders. In this review, I will check the quality, as well as the performance in the river. 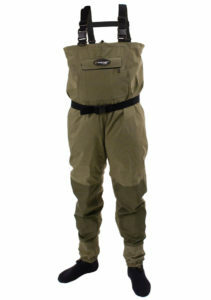 For fly fishing, breathable waders are pretty much a must-have item during the summer month. There is not much worse than having sweat soaked pants only after half an hour of fishing, just because you are wearing neoprene waders. Still, many people feel like they have no other option than neoprene. Most of the time this is because they need something more sturdy than the materials used to achieve breathability. If you have to walk a few miles to get to your favourite fishing spot, dense bushes can put up a challenge for your waders, and only the smallest hole will lead to annoying leaks. The Frogg Toggs Hellbender are made from 4-ply breathable material, where four just refers to the amount of layers used here. They have their own technology called “DriPore Plus”, but I guess that’s just marketing since they do not really specify, how it’s supposed to be different to other breathable material. An additional outer shell made from nylon is intended to improve longevity and resistance against said bushes that you could encounter. The seams look well-made and they better should be, since there are a lot of them. More seams results in more potential flaws were water could enter. As long as the seams are properly sealed, this is obviously not a real problem, but in the long run, it could turn out to be one. The knees are reinforced, making it a total of five layers in this area. This section is definitely the most vulnerable one, so reinforced knees are a must have feature for me. The neoprene booties are made from 3.5mm neoprene and are surprisingly flexible. Sizing and fitting are on point. I used the sizing chart that you can find on Frogg Toggs website and besides that they are a little tight in the crotch area, everything fits as expected. The cut is slim, no baggy look and they are generally well designed in terms of style. As mentioned before, the booties are flexible. I wore them one time with and one time without a thicker pair of socks and did not feel a big difference in terms of fitting. They adapt really well to the form of your feet which provides comfort in a pair of wading boots. If you consider yourself as a bit bigger, they also offer “stout” versions of the Hellbender. Starting at the top they come with a solid amount of for pockets. They have big front pocket on the front combined with bilateral handwarmer pockets. They also offer a slightly smaller zip pocket on top of it. The fourth pocket is on the inside and could work as security pocket for keys or similar. All in all a nice kit! As mentioned earlier the Frogg Toggs Hellbender have reinforced 5-layered knees, which greatly reduces the risk to puncture them in this area while kneeling, for example with sharp stones. Gravel guards are included as well and will prevent debris or sand entering your wading boots. Also included is a flexible wading belt supported by belt loops. Honestly, I was looking forward to giving these waders a try under real conditions, the list of features as well their appearance looked promising. As usual, I took them fishing in a local stream and my first impression was pretty good. They were fairly flexible, meaning they did not limit my movement wading through the water and because of their slim fit, I did not feel much current in them either. After solid two hours of fishing, the next test was a small one-mile hike to another fishing spot and I made sure to pass a few bushes to give them a challenge. Arriving at the next pool, where I initially planned to fish a couple more hours, I went back into the water only to feel some water entering around the crotch, as soon as I was waist deep. Unfortunately, it seems like the hike was too much for the seams in this area. Although I could not really see the leak at first, since it was really small, it was definitely big enough to discourage me from entering deeper waters. Back at home I checked some online-shop reviews and noticed, that ratings significantly dropped in the last year. People reporting, that they bought their second pair after they used their first for several years, only to find out that the new ones leaked right from the beginning. I suspect that Frogg Toggs changed some manufacturing processes, resulting in worse quality. I sent mine back already and once again I have to say, that Frogg Toggs really knows how to do Customer Service. No questions asked they took them back. A lot of useful features! Although they leaked during the first use, this will obviously not happen with every sample. 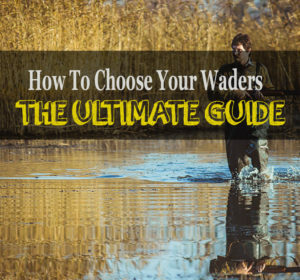 You could be lucky and get a great looking pair of waders with decent features for a moderate price. Even when you get a pair that leaks, Frogg Toggs will replace it without hesitating or refund your money. You have to decide if this is worth your time and if you feel like it is not, check out the Redington Crosswater which are almost identical.